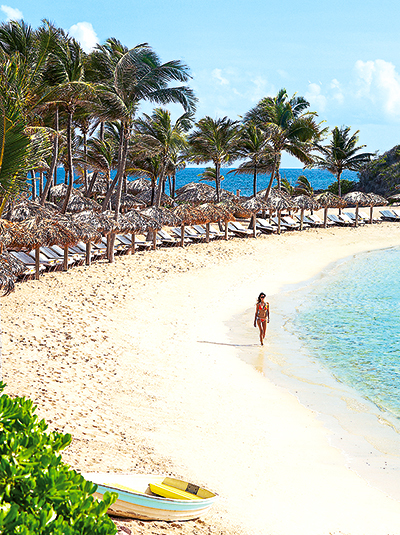 Connect with friends and loved ones in some of the world’s finest hotels, the ideal setting for a memorable vacation. Whether you’re interested in fun for the whole family or a romantic retreat for two, our exclusive collection includes more than 950 hotels, resorts, lodges, spas and unique places to stay around the globe to commemorate any occasion. Plus, when you reserve with us, a myriad of exclusive privileges enhance your stay, such as early check-in and late check-out, hotel and spa credits, a room upgrade and more. The scenic shores of these oceanside resorts offer serene tropical vistas, miles of sandy beaches and balmy ocean breezes sure to soothe soul. At The Brando’s exclusive private island of Tetiaroa, you’ll become completely immersed in the island lifestyle with activities including deep-sea fishing, Tahitian cuisine demonstrations and Polynesia dance lessons. 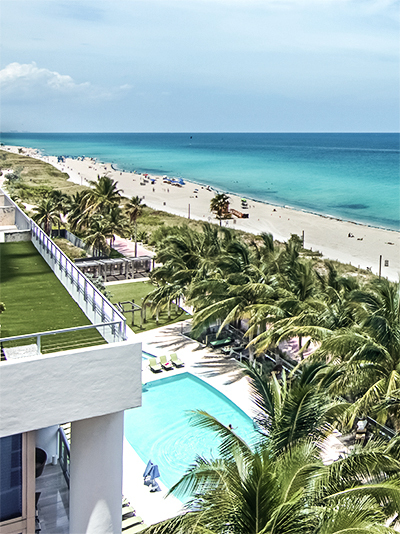 Or lounge on Miami’s largest stretch of private beachfront at Carillon Miami Beach. This 150 all-suite spa and wellness resort offers the perfect balance of fun and rejuvenation — from two pools and weekly fitness classes and workshops to healing spa treatments. 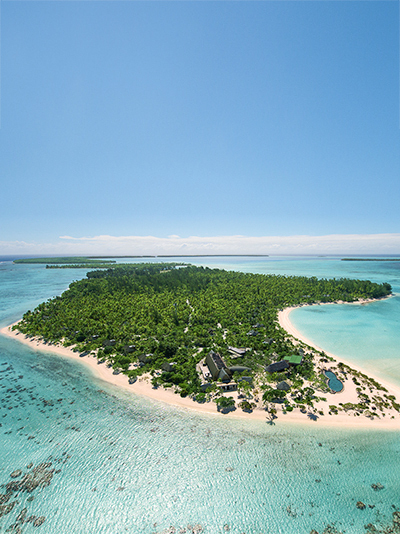 The Brando has brought to life Marlon Brando’s dream of preserving the island of Tetiaroa and Polynesian culture. From a warm welcome with song and tiare flowers, to Tahitian massages in the Varua Spa, the spirit of Polynesia envelops and replenishes. Every comfort awaits in 35 private air-conditioned villas with separate sitting room, media center and private plunge pools. Taste Polynesia in the cuisine made with ingredients from the resort’s own gardens. 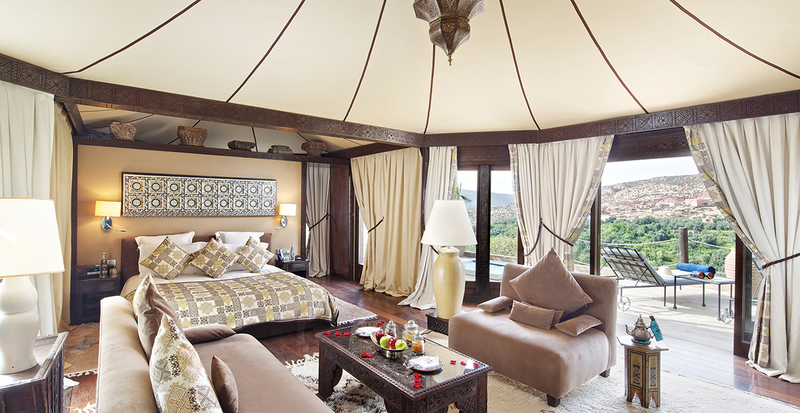 Plus, all guests enjoy full breakfast for two daily and enjoy all-inclusive amenities. Carillon is about wellness and balance. Here, the energy of the Atlantic sets the stage for guests to craft the type of vacation they want without ever having to leave the property. The all-suite resort cradles guests in comfort and serenity, and nourishes body, mind, and soul through health-conscious dining options and Miami’s most comprehensive fitness and wellness programs. Carillon does not impose any preconceived idea of what wellness should be, but it allows you to define your own experiences, which may include enjoying craft cocktails, indulging in traditional food choices, or doing nothing at all. You can rest assured that you can expect the highest level of service and attention to detail Carillon. Timeless elegance, a life well lived — this is the essence of Belmond La Samanna. It’s been heralded as one of the Caribbean’s most elegant resorts for years — an authentic French Caribbean hideaway combining classic luxury with natural extravagance. Entirely self contained and private, each of these oceanfront three- and four-bedroom residences offers 4,600 square feet of sumptuous splendor including a full kitchen, dining room, indoor and outdoor living room, wrap-around terraces and a stunning infinity-edge pool. 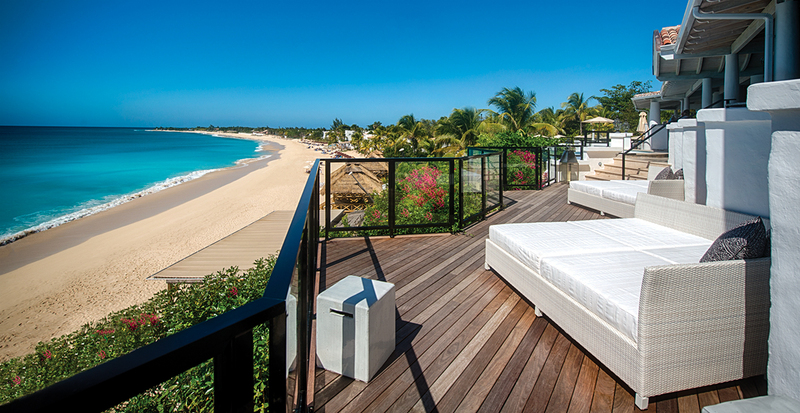 Belmond La Samanna is the gateway to the very spirit of St. Martin, an exclusive enclave of simple luxury and island decadence. Wine and cheese tasting. five-night minimum stay required. St. Barth’s most irresistible private enclave, Le Guanahani is spread out over 18 secluded tropical acres on its own peninsula. Within this captivating landscape, 67 vibrantly hued guest cottages are scattered along garden paths that wind through lush bougainvillea, hibiscus and palms beside the sweeping beaches and reef-protected lagoon. 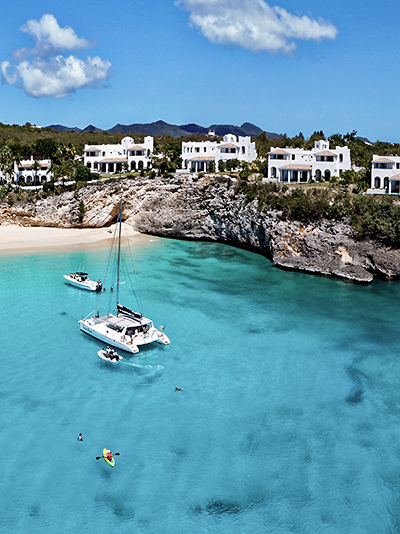 The island’s finest boutique resort offers two pools, a restorative Spa My Blend by Clarins, a full suite of water sports, a fitness center, flood-lit tennis courts and engaging children’s programs. Plus, all guests enjoy buffet breakfast at Indigo restaurant. 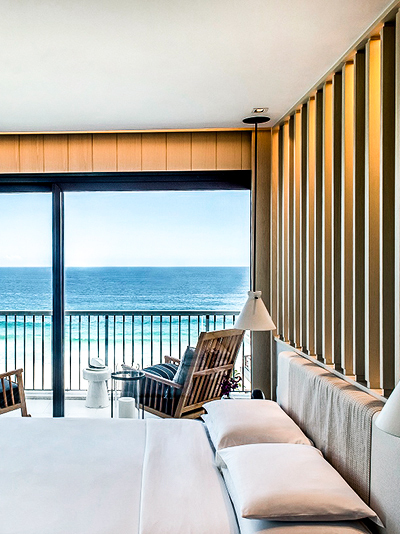 Located in Rio’s exclusive Barra da Tijuca, Grand Hyatt Rio de Janeiro has a stunning beach-front location overlooking the blue-green Atlantic Ocean. The 436 sophisticated rooms and suites are contemporarily designed to create a tranquil and modern atmosphere, with the cool-casualness Rio is famous for. Three signature restaurants, designed by acclaimed Brazilian architect Arthur Casas, showcase gastronomic choices that highlight local flavors. 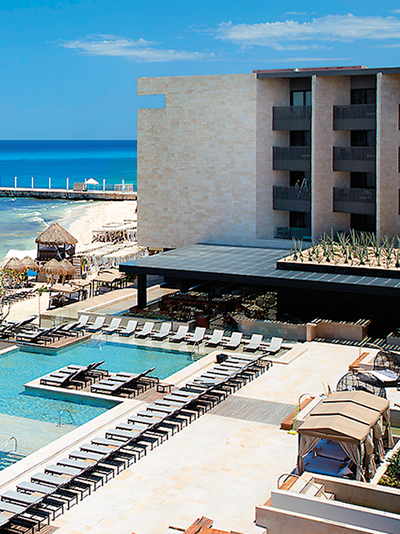 Grand Hyatt Playa del Carmen Resort features spectacular design in the midst of the most vibrant, modern and innovative area of Playa del Carmen. Its extraordinary location, facing the turquoise waters of the Caribbean, stands as a wonderful option for those seeking a lifestyle break beside the most beloved beach in the area, Playa Mamitas. For guests seeking Playa del Carmen resorts with good entertainment, music festivals, bars, beach clubs and restaurants during the day, this beach is the best setting. Unique food and beverage concepts and signature offerings from restaurants and bars will set the stage for you to enjoy the local flavors of Playa. On top of their impeccable luxury service, these hotels in global cities boast a favorable location to landmark historic sites, authentic local cuisine and iconic shopping destinations. 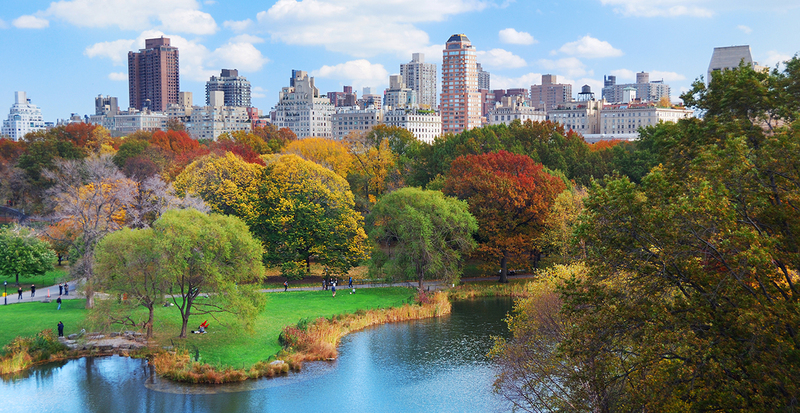 During a stay at The Surrey, afternoon strolls through Central Park lead to evenings sipping signature cocktails at the rooftop garden as you mingle with New York socialites and gaze out over the cityscape. Across the globe at the Sofitel Legend Metropole Hanoi in Vietnam, enter a calm sanctuary of refined style, with amenities including an elegant spa and a heated outdoor pool. White glove service awaits those looking for the finer things at The Surrey, New York City’s only Relais & Châteaux hotel. An intimate, sophisticated address on Manhattan’s Upper East Side, it began as a townhouse to the stars of the 1920s and is now a hot pied-à-terre. The Surrey offers world-class dining by Café Boulud, the atmospheric Bar Pleiades, Cornelia Spa and a Private Roof Garden and rooftop bar featuring seasonal cocktails. An impressive collection of 31 original modern artworks are dispersed throughout the private and public spaces. The hotel’s contemporary, exquisite salons and suites were created by Lauren Rottet, accommodating celebrities, style-icons and art aficionados from all over the world. Sofitel New York is a deluxe Four- Diamond hotel located in the heart of Manhattan on 44th street between Fifth and Sixth Avenues. The ambiance and décor of the hotel combines the spirit of America with the style of France. A warm, welcoming lobby combines a mixture of contemporary and Art Deco elements, and stylish, contemporary rooms have all the expected luxury amenities. The hotel offers friendly and efficient service, excellent dining, meeting and banquet facilities and a 24-hour, complimentary fitness center. 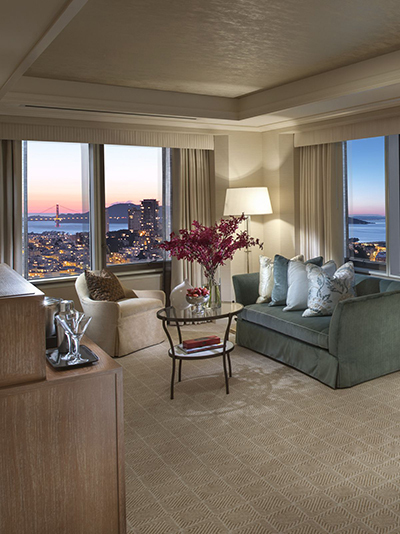 Conveniently located in the heart of the city, Loews Regency San Francisco Hotel is within walking distance of Union Square and many famous landmarks. The hotel is renowned for the beauty of its interiors and sublime views of the city, and the Bay, with its beautiful bridges. 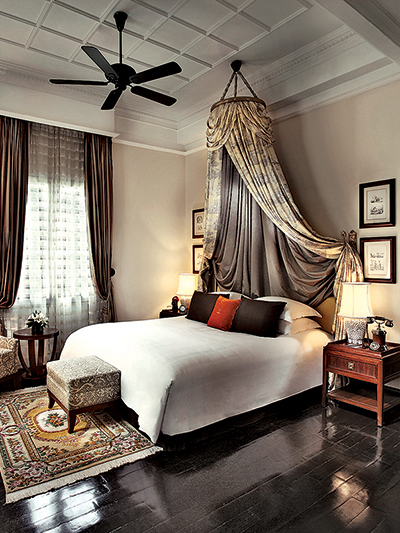 Elegantly furnished guestrooms with subtle accents and Italian marble bathrooms are standard. 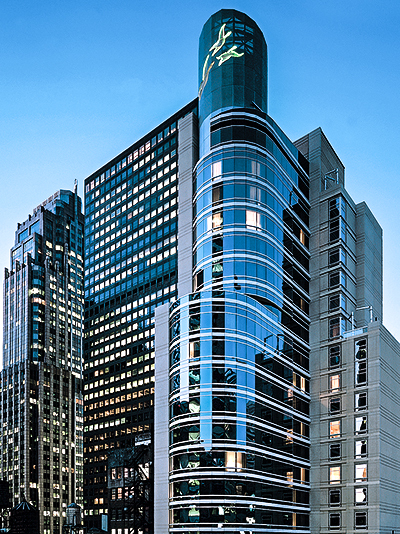 The location of the rooms and suites, high in the city’s third-tallest building, is unmatched anywhere in the city. Situated on the famous Bond Street, surrounded by the world’s most exclusive brands, The Westbury is favored by those seeking the Capital’s best. 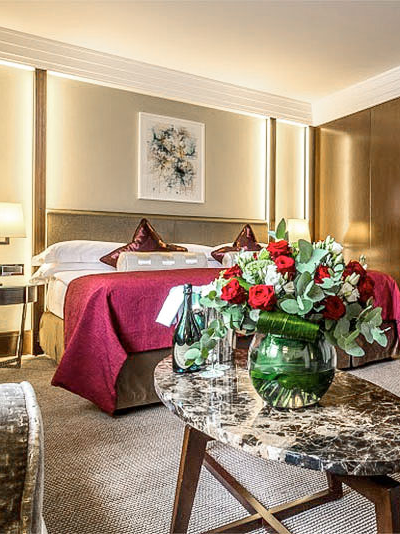 The Westbury’s luxurious new bedroom and suite collection has been splendidly redesigned, setting a new standard in five-star hospitality by combining sophisticated comfort with elegant style. Home to Tsukiji Sushi, Michelin-starred Alyn Williams at The Westbury and multi-award-winning Polo Bar, The Westbury offers a prodigious dining scene within the finest address in London. Situated in the heart of Hanoi with its leafy boulevards and lakeside pagodas, this colonial-style hotel is ideally placed within walking distance to the famous Hanoi Opera House, Hoàn Kiếm (Lake of the Restored Sword) and a number of art galleries and handicraft shops. Sofitel Legend Metropole has been Hanoi’s legendary landmark since its establishment at the turn of last century and has always proved a popular rendezvous spot for both business and leisure travelers. All 364 rooms are beautifully decorated. In the historical Metropole wing, original grandeur and charm have been preserved, while in the Opera wing, the newly renovated rooms offer a neo-classic elegance. The hotel has three restaurants and three bars including Le Beaulieu Restaurant, Spices Garden Restaurant, Angelina Restaurant and Lounge, iconic Bamboo Bar, Le Club Bar and Parisian sidewalk-café La Terrasse du Metropole. Daily tours of Metropole’s Path of History and bomb shelter, with an Ambassador of History, are offered exclusively for guests staying at the hotel. Satisfy your nomadic aspirations with trips to some of the world’s most fascinating off-the-beaten-path destinations. Set on a hill overlooking the beautiful Saanenland in the heart of the Bernese Alps, Gstaad Palace overwhelms with alpine majesty and exits with adrenaline-pumping activities like paragliding, mountain biking and heli-skiing. 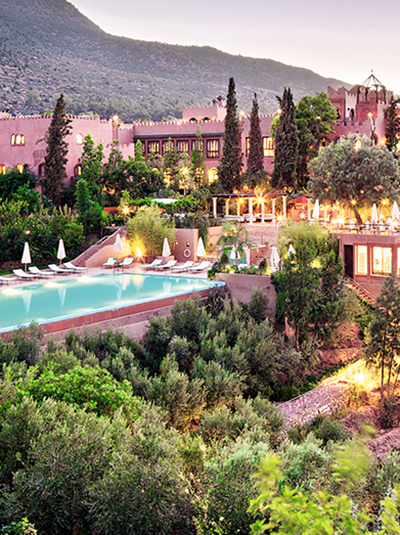 Hidden in the foothills of the Atlas Mountains, Kasbah Tamadot is a luxurious Moroccan retreat. Explore the surrounding countryside with a sure-footed resident mule as your steed, or relax during a Moroccan cleansing ritual at the Asounfou Spa. 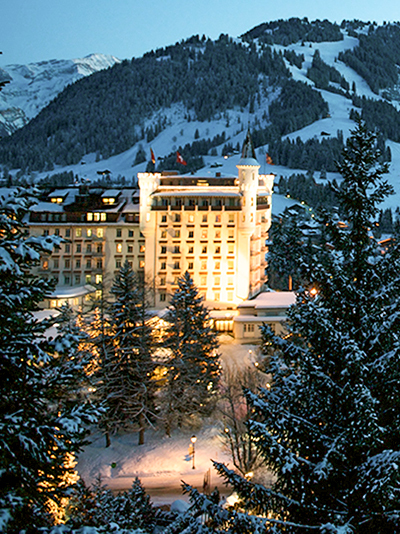 The Gstaad Palace is one of the last family-run luxury hotels — combining perfectly contemporary glamour with alpine coziness. Surrounded by over 100 miles of slopes, it invites both beginners and skiing aficionados to enjoy winter wonderland at its best. The landmark of Gstaad also features the Palace Spa including eight treatment rooms, a private spa suite, saunas and steam baths, relaxation areas with incredible views, indoor pool, outdoor pool with Jacuzzi, a state-of-the-art gym, a PiIates studio and a unique Hammam experience with seven rooms. Kasbah Tamadot, part of the Virgin Limited Edition portfolio, is a divine hideaway where the spirit and charm of traditional Moroccan design is beautifully infused with contemporary elements. Bought by Sir Richard Branson during one of his famous ballooning expeditions, the Branson family continues to play an important role in the life of Kasbah Tamadot. Each of the 28 rooms and suites has been individually decorated to reflect the beautiful architecture of the building and features antiques from all over the world. Located near the village of Asni in Morocco’s High Atlas region, a mere 45-minute drive from the center of Marrakech, within its protective walls guests will find an ambiance of luxurious serenity with a hint of exotic adventure among the complex’s courtyards and exquisitely landscaped gardens. From spectacular resorts in exotic locales to luxurious hotels that are close to home, we'll help you find the ideal accommodation every time you arrange your travels with us.